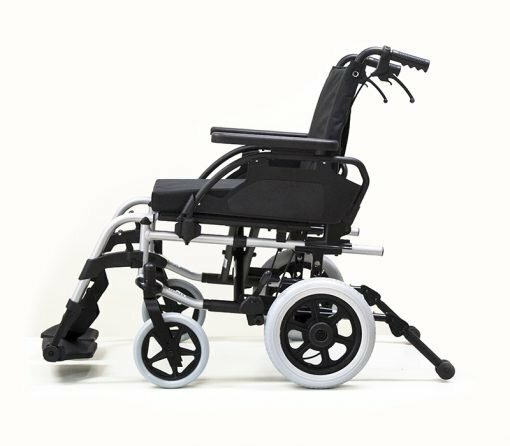 Improved adjustability and rigidity combined with a modern look this Breezy Basix2 wheelchair provides an even broader range of clinical solutions to the user. Enhanced wheel adjustability to suit more clients, which includes 4 vertical positions, 2 active and 2 passive horizontal wheel positions. Additional features include 12″ transit wheels, Height adjustable arm rests and height adjustable push handles, Sliding cross brace adjustment can achieve multiple seat depths of 41cm/16“to 46cm/18“, Tension adjustable backrest now extendable from 41cm/16”to 46cm/18”, Angle adjustable footplate ( /- 15°), Aluminium footplate hangers ( 70°) lower leg length adjustable 35 – 50cm, Solid 17.5cm x 4cm/7”x 1.5” front castor and a Nylon padded slung seat and backrest. AVAILABLE in SELF PROPELLING OR TRANSIT. The Breezy BasiX ultra lightweight frame was designed for personalised comfort and function. Customizable seat heights allow the seat to be lowered for foot propulsion, if necessary. Armrests conveniently flip back, enabling you to transfer in and out of the wheelchair with ease. Available in 3 sizes: 38cm, 43cm, 48cm and 52cm seat widths.